You will enter on the south slope of the Acropolis, where you get to visit the Dionysus Sanctuary and Dionysus Theater - the oldest Theatre in Europe - and see where the Ancient drama was born! Then you will walk up the slope leading to the Acropolis monuments while enjoying panoramic views of the city. Our knowledgeable licensed guide will provide in a fun and entertaining way all the information necessary to help you connect with the past and have an experience of a lifetime. You will see the Erechteion and the famous Caryatids, the Propylaia, the Nike Temple and of course the Parthenon! The tour ends on the Acropolis approximately at 13:00 (1:00 pm). 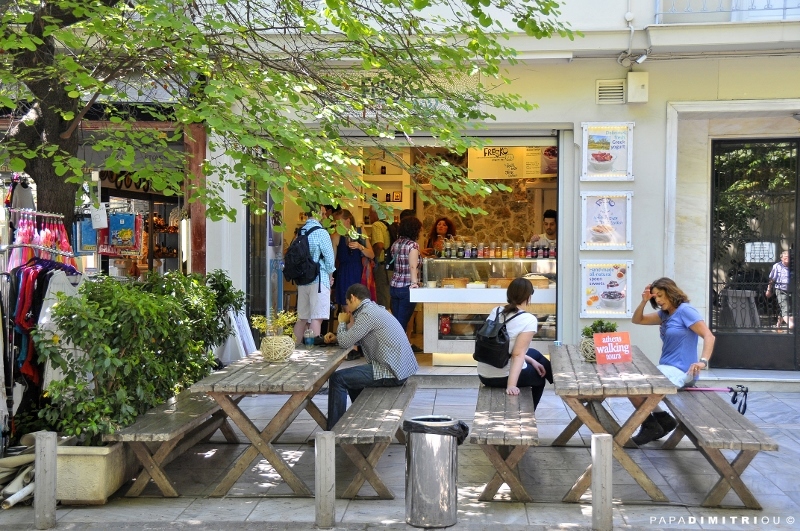 Our staff, holding an orange Athens Walking Tours sign, will be waiting for you at "Fresko Yogurt Bar Acropoli" located at 3, Dionyssiou Areopagitou st, which is at the beginning of the pedestrian walkway that takes you from Hadrian's Arch, Siggrou av (also written as Syngrou), to the Acropolis. Please be at the meeting point 15 minutes prior to given tour departure time. Please be at the meeting point at 11:15 am. This tour is a continuation of the Athens City Tour and the Acropolis tour which starts earlier. Our guide with his/her group will arrive at the meeting point between 11:15 am and 11:30 am the latest. Look out for our guides holding an orange colored Athens Walking Tours sign. 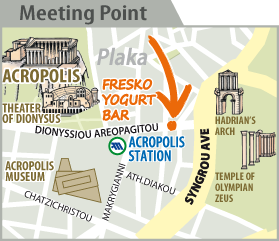 Tip: While at Fresko Yogurt Bar, it is a good opportunity to try a serving of fresh authentic Greek yogurt, best when topped with honey or a Greek spoon sweet. Be sure to ask for a free yogurt sample! *On Good Friday (Greek Orthodox Easter), the tour starts at 12:15 pm. The entrance tickets are included in the tours fee. Please have in mind that if you are a student you must hold a valid ID at the time of the tour. Discounted rates apply from 1 November to 31 March.